Analyzing news on social media is an important skill to know and use. It requires critical thinking, research and reading between the lines. It is important not to believe everything you read. 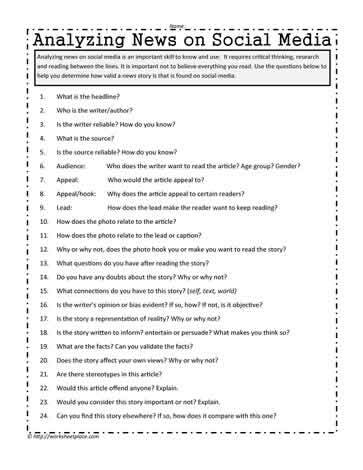 Use the questions below to help you determine how valid a news story is that is found on social media. Is the writer reliable? How do you know? Is the source reliable? How do you know? Audience: Who does the writer want to read the article? Age group? Gender? Appeal: Who would the article appeal to? Appeal/hook: Why does the article appeal to certain readers? Lead: How does the lead make the reader want to keep reading? How does the photo relate to the article? How does the photo relate to the lead or caption? Why or why not, does the photo hook you or make you want to read the story? What questions do you have after reading the story? Do you have any doubts about the story? Why or why not? Is the writer?s opinion or bias evident? If so, how? If not, is it objective? Is the story a representation of reality? Why or why not? Is the story written to inform? entertain or persuade? What makes you think so? What are the facts? Can you validate the facts? Does the story affect your own views? Why or why not? Are there stereotypes in this article? Would this article offend anyone? Explain. Would you consider this story important or not? Explain. Can you find this story elsewhere? If so, how does it compare with this one?